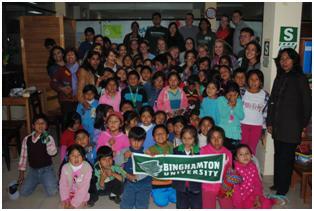 “A Practical Way to Change the World” is the tagline that we use for our MPA program at Binghamton University. Our mission is to develop individual and institutional capacity for community-based public practice. Since I have been writing about capacity in my column, I thought I would take the time to discuss the relationship between capacity building and MPA programs. By using examples from our program, I hope to inspire other MPA programs, local government and nonprofit agencies to work together to increase their capacities. There are two primary ways that MPA programs can help build capacity, both noted in our mission statement. The first is by developing individual capacity. We do this by educating students who will work in the public and nonprofit sectors. The second is by working with community organizations directly to help them increase their own capacity. However, these methods are not mutually exclusive. Many of our capacity building efforts with local organizations involve our students. Last month, Angela Pool-Fauni reflected on the benefits of this type of experiential learning for students and communities in her PA TIMES online column. What follows are four creative examples of how our students, via coursework, have contributed to local communities. Through our department, we offer both undergraduate and graduate courses that focus on philanthropy. These courses provide students with hands-on experience raising money and evaluating organizational needs and performance. Students in these courses make decisions about disbursement of funds from the Philanthropy Incubator. Initially funded by Campus Compact in 2009, the Incubator received a grant from the Community Foundation for South Central New York’s Harriet Ford Dickinson Fund in 2010, and has received annual support from the Learning by Giving Foundation since 2010. This course provides students with the chance to work with local organizations (potential grantees) and gives those organizations information about student and community perceptions. Over $100,000 in grants have been awarded from the Incubator with more than $10,000 raised by the students through Party with a Purpose, a biannual event run by MPA students and master’s students in social work. For more information about how philanthropy has been incorporated into 88 experiential learning courses, see David Campbell’s JPAE article from Spring 2014. Students at Corazon de Dahlia. One of the unique aspects of our MPA program is our specialization in sustainable communities. As a part of that specialization, two faculty members (Nadia Rubaii and Susan Appe) created a course titled “Local Development in the Andes.” This course incorporates a three-week study abroad in June to Peru, with a preparatory course that begins in the late spring. Through this course, students learn about the dynamics of sustainable development and the interconnections between environmental issues, economic vitality, social equity and cultural identity. Students are able to engage more deeply in their study abroad through a service-learning component with several Peruvian community-based nonprofit organizations. For example, Corazon de Dahlia provides after-school programs for children from poor rural families in communities outside of Cusco, and Abre Puertas, a grassroots women’s cooperative which cooks and serves nutritious meals to communities in extreme poverty. George Homsy incorporated the emphasis on sustainable communities into our core research methods class. He had his class conduct a public transit ridership survey in which students sought not only to measure satisfaction, but also sought to collect data that would help the transit planners make service adjustments and attract new riders. This course also provided assistance to the local Town of Triangle. When the town undertook a comprehensive plan process, the students stepped in to conduct a resident survey, a project that the town did not have the fiscal or technical capacity to conduct. Having worked for years with local organizations with various types of information technology problems, we developed a core course called “Managing Information and Technology.” This two-credit course introduces future administrators to the language, possibilities and challenges of information technology. Recently, as a part of this course, Kristina Lambright assigned students to help local nonprofit agencies. Students were responsible for analyzing the organization’s Facebook page. They identified strengths and weaknesses of how the organization was using Facebook. Students also made specific recommendations about how the organization could better use Facebook in the future and identified the next steps for implementing their recommendations. This project gave the organizations concrete ideas to consider on how to use social media more effectively in the future.